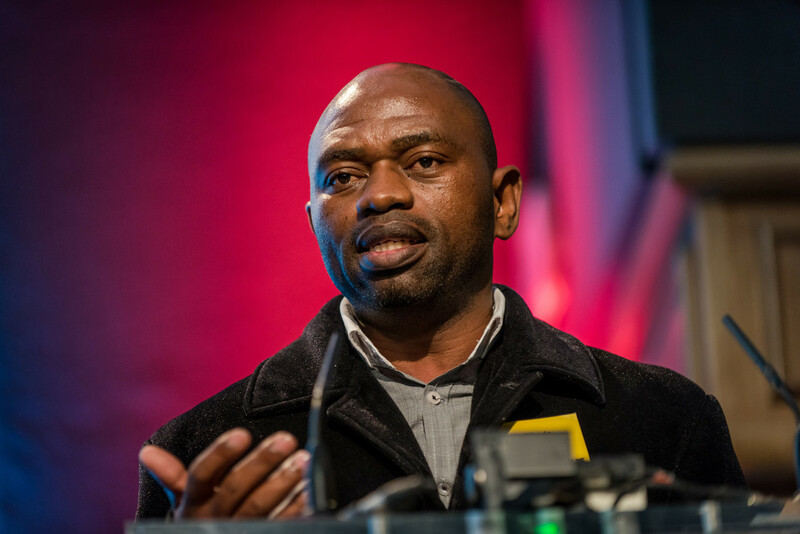 A statement released by Abahlali baseMjondolo on 7 July 2018 claimed that its president S’bu Zikode’s vehicle had been maliciously tampered with and his life was “in grave danger”. The alleged attempt on Zikode’s life comes after reports in early June that ANC chief whip in the City of eThekwini, Nelly Nyanisa, had accused Zikode of being “hellbent” on rendering eThekwini ungovernable. It was also reported that Nyanisa had threatened to “deal with” Abahlali. In an exclusive interview with New Frame, eThekwini mayor Zandile Gumede claimed that she was awaiting the outcome of an internal investigation into Nyanisa’s comments. Gumede, however, said that “there must be consequences… because a leader cannot utter words willy-nilly”. Gumede suggested that apparent threats like those made by Nyanisa “provoke the communities and they lose hope in us”. Abahlali alleges that as many as ten of its members have been assassinated over the past five years. In two cases there have been convictions after the murder of the movement’s members. In 2013, 17-year-old Nqobile Nzuza was shot in the head by a police officer during a protest. Five years later police officer Phumlani Ndlovu was convicted for the murder. Only weeks before the alleged attempt on Zikode’s life, Abahlali’s chairman in eKukhanyeni in Marianhill, S’fiso Ngcobo, was assassinated. Gumede said the City of eThekwini was conducting an internal investigation into the killings. “It is not good to kill them [Abahlali members],” she said, “the head of security is working hard to stop these killings”. However a source on the city council told New Frame that no internal investigation into the killings has been discussed during council meetings. Zikode, in a previous interview with New Frame, painted Gumede as a duplicitous presence in Durban’s toxic and often violent local politics. Zikode said there was a time when Gumede was “down to earth” and supportive of Abahlali, but that her administration has since become hostile to the movement. “The City has been taken over by gangsters,” says Zikode. Nevertheless, Zikode said Abahlali was concerned by the recent escalation in what he described as the City’s rhetoric. He claimed it is “a language that is commonly used” in the lead-up to assassinations. According to Abahlali’s statement, Thembinkosi Qumbelo, Nkululeko Gwala, Thuli Ndlovu and S’fiso Ngcobo, all activists who were assassinated, “knew that they had been marked for death before they were assassinated”. Zikode claimed threats against the movement and its members, are “a form of punishment for speaking truth to power”. Abahlali is a threat to the ANC, said Zikode, because the movement represented popular power outside of the ruling party. New Frame’s source on the eThekwini council said Abahlali’s criticism of the local ANC, and what it said were the party’s abuse of housing budgets in particular, are at the heart of the acrimony between Abahlali and the City. Zikode said the movement was not looking far from City Hall for explanations of the assassination of its members.